Welcome back to the Beginner’s Guide to Modern, the article series where we help Standard players make the transition to Modern. It’s been a while since my last entry in this series (far longer than intended), but now I’m back to deal with what I hear is the most interesting, frustrating, and intimidating aspect of Modern compared to Standard: deck diversity. This is not just about the number of playable decks, though that is a factor. It’s also about the variety of different playstyles and strategies. Standard decks, especially recently, tend to be creature-centric (and in my opinion kind of homogenized in general, outside of GW Token’s dominance). If you play a lot of cheap creatures, you’re an aggro deck. Fewer and larger creatures, midrange. Very few, very large creatures equals control. Yes I realize this is an overgeneralization and misses a lot of nuance, but my point is that if you’re trying to classify and prepare against decks in Standard it’s fairly easy. Not so much Modern. Yes, you can broadly classify Modern decks based on creature density but that misses the very distinct types of decks that are present in Modern and the very different ways they play. Let’s use aggressive decks as an example. Standard’s Wr Humans has a lot of similarities to Merfolk, in that both are very aggressive linear tribal strategies that seek to swarm the opponent with small creatures that grow each other. Merfolk differs in its disruptive elements and evasion which demand different answers. This is completely different from Infect, which is arguably still an aggro deck but instead seeks to “get there” in a single attack. Elves is also a linear tribal strategy, but it plays more like a combo deck. Elves and Infect have strong combo elements but are still in the aggro deck family despite behaving nothing like Wr Humans. A deck could fall neatly into the aggro/control/combo brackets in Standard and that would be the end of it, but Modern decks rarely do that cleanly. As a result, I’ve seen Standard players adopt strategies to counter deck types that work well on paper but in reality accomplish little to nothing. Adding more removal to a deck and trying to grind out advantage works well to beat Standard aggro and can work in Modern but it can also leave you vulnerable to certain angles of attack that one-for-ones don’t sufficiently cover. This is one reason that Modern has few reactive decks. Therefore today I am going to broadly lay out the types of decks that you commonly see in Modern, categorized by how they win. This is not about the overall archetypes but rather a general examination of Modern gameplans and strategies. Along with this I should add that this is intended as an introduction, so any missing detail is intended to go in follow-up articles later on. For today, I’ll just be laying out the strategies, providing some examples, and giving advice on how to approach the matchups. By far the largest category of Modern decks, aggressive decks all share a love of creatures and winning as uninteractively as possible. Where they differ is in how they approach that uninteractive kill. These are decks that play creatures and attack. No frills, no tricks. Deal 20 damage as quickly as possible. How they go about it may differ greatly (Merfolk turns small creatures into big evasive ones, Zoo just plays a ton of very efficient creatures backed by burn) but at their core they’re just trying to kill the opponent before they’re overwhelmed by card power or synergy. When you think of aggro most players think of these decks and they’re the most recognizable and understandable to the Standard player. Efficiency and low mana-curves are the tools of linear aggro. All these decks rely on high creature density backed with some support cards and a low land count. In Burn’s case the support spells are arguably the most important part of the deck, but it operates on the same principles as the other decks if from a different angle. Some will have synergistic elements (Merfolk particularly) but they’re compliments to the simple, old-school beatdown. As the inheritors of the old-school strategy they also tend to suffer from the same weaknesses, to varying extents. Their high creature counts mean sweepers tend to be very effective, though many decks have learned to mitigate or counter sweepers. Generally, playing the classic game of one-for-one answers works as long as you don’t fall behind or run out of answers before they run out of threats. Lifegain can buy time but should not be relied on. With the exception of Burn, linear aggro decks are able to take very large chunks off your life total with each attack and unless you have your own clock gaining life each turn will not outpace their damage output. Racing is an effective and often under-used tactic against linear aggro. They are very fair decks and if you can do a fair thing faster or do something unfair linear aggro lacks the disruption or interaction to stop you. These decks look terrible on paper. They are filled with weak cards that don’t do much on their own, and can make you wonder why anyone though the deck was viable. Then they drop a power card that supercharges those weak cards and simply wrecks you. Memnite, Ornithopter, and Signal Pest are pretty unimpressive on their own, but throw a Cranial Plating into the mix and suddenly you have one of the best decks of all time in Modern. Power-card decks rely on a small number of cards that are extremely powerful when surrounded by the right cards, and are worthless otherwise. Heritage Druid and Nettle Sentinel are a terrifyingly powerful mana engine, but need Elvish Archdruid and/or Ezuri, Renegade Leader to have a real impact. The payoff cards conversely have no impact without a lot of their support cards on the field. The decks tend to be made of the power cards and their enablers and ways to find the power cards. When the whole system is meshing together and running well they’re the most terrifyingly powerful decks around. When something breaks down they can’t work at all. The most common way to fight decks like this are to target the power cards. If a deck is built around it, it’s pretty important, and if it’s pretty important then it should be a high priority. Moreso than many other deck types, if you take out even a few payoff cards then these decks are anemic beatdown decks at best. Sweepers are also a potent tool, even more than other decks, since these tend to be critical mass decks beyond what linear aggro demands. Elves in particular needs to play into sweepers for its payoff cards to actually win the game. You are unlikely to win a pure race against these decks. Power-card decks tend to poses powerful mana engines so that they can turn on the payoff cards quickly and win immediately thereafter. You need to disrupt their engines or payoffs to buy yourself time to win. That said, these are not very robust decks and a little disruption goes much further than you think. I dislike these decks. I have to respect their power but I don’t think they’re good for Magic. Gotcha decks ask if you have the right interaction at the right time. If you do, they lose. If you don’t, you lose. Each deck is designed to either win in a single turn using pump spells or simply play threats that cannot be removed. They tend to have relatively low creature counts and are focused on leveraging some unfair mechanic to devastate unprepared opponents before their own weaknesses doom them. The rest of the deck are pump spells to maximize the impact of their unfair mechanic and protection to protect their fragile and scarce threats. As such these are incredibly powerful and explosive decks that have been steadily climbing the tiering charts since Twin was banned. Their speed is frequently enough to simply slip past every other decks defenses without issue. It is hard to recommend a playstyle against these decks because of variance. These decks will lose to certain cards (Bogles to Cruel Edict, Infect to Night of Souls’ Betrayal), but you have to draw them or draw enough of them. On the other side sometimes they just have broken hands that you cannot beat, such as Infect’s turn two win. They can also fail to open a keepable hand and mulligan to death. Variance is their greatest weapon and weakness. Death’s Shadow runs a lot of cantrips to minimize this problem, but it’s still very much at the mercy of the Random Number God. Gotcha! decks have some of the highest positive variance and the highest negative variance of any Modern deck type. They’re trying to maximize their explosive potential and so have to play for the big wins rather than a lower variance, more robust plan. As such I recommend using a solid average variance against them. To put it mathematically, if they swing wildly between +10 and -10, you want to be above zero as much as possible. You won’t match their best hands, but your hands should be at par or better than theirs more of the time which should translate into more wins. Actually racing these decks is very hard because of their speed (unless you are Burn against Death’s Shadow) and the risk that you will simply die to Become Immense and Temur Battle Rage. That said, if you don’t present your own clock these decks will eventually put together their unfair clock, so you need to kill them before they get the chance. These are the police decks. The interactive decks that keep the linear aggro and combo decks in check. Full of removal, card advantage, and mid-level threats Modern’s fair decks seek to bury their opponents in card power and quality. They want to kill your creatures, play their own, and disrupt your gameplan long enough to win. The typical fair deck plays a lot of very good cards that each stand on their own but get better when paired together, like Thoughtseize and Tarmogoyf or Snapcaster Mage and Lightning Bolt. They play similarly to Standard midrange decks in that their plan to kill anything threatening, disrupt the opponent’s gameplan and win through value and powerful creatures. However, in Modern they often take the role of control decks and a check on the speed of the format. These decks play individually strong cards that compliment each other, but there’s no true synergy like a combo or aggro deck. As such these decks live or die on whether their answers match up against the opponents threats and their ability to draw enough of them. To beat these decks you need to overwhelm their answers and race their clock. Synergy can overpower them but it is also vulnerable to their disruption. I’ve found it more effective to try and win the attrition game and simply emerge with the last threat standing once both decks go hellbent. Card drawing and two-for-ones are extremely effective. Degenerate decks will frequently be able to deploy too quickly for the fair decks to effectively counter, but can also more readily fall prey to a well timed Thoughtseize or Mana Leak. Decks that kill from pure card synergy. These are decks that assemble certain cards to produce an instant, or effectively instant, win. For some this is all that they do. Others have backup plans. These are the decks that everyone thinks of when they think of combo decks, the true inheritors of Prosbloom. Decks that play a lot of cards that do nothing on their own but together create a critical mass of card advantage and mana that the deck funnels into a single win condition to instantly kill the opponent. Which often entails the pilot playing a lot of Magic by themselves while their opponent counts tiles on the ceiling, waiting to find out if they’re dead or if their opponent fizzles. What defines the truly unfair combo decks from others is that they are all-in on their combo. It is impossible, or at best extremely implausible, for them to win any way but by comboing off. Ad Nauseam cannot win without resolving the namesake card and drawing their deck, Grishoalbrand struggles if it cannot cheat Griselbrand into play. As such beating these decks comes down to preventing them from going off. Slaughter Games for their Ad Nauseam is the most extreme example, but the right spirit. Discard can prevent the combo chain from beginning and counter-magic can break it up. There exist powerful sideboard cards against decks like this like Games, Rest in Peace, and Meddling Mage which completely invalidate the combo engines. You’re unlikely to race an unmolested combo deck unless you’re one of the Gotcha! decks or another unfair combo, but it is imperative that you present your own clock against these decks. Given enough time, combo decks will be able to sculpt the perfect hand to fight through even the toughest defenses. Combo players are aware of their weaknesses and will counter-sideboard against hosers, so you cannot just rely on them conceding to a hate card. You have to pressure them. Conversely, these are decks that can combo off in some fashion but don’t have to in order to win. They have a backup plan as a fair deck. Whether this involves playing a midlevel creature beatdown or control game, these decks are built to have several different avenues to victory if one plan is not viable. Some of these decks, like RUG Scapeshift, are primarily combo decks that use control elements to buy them time to combo off. Their Plan A is the combo, but they have a Plan B that wins via card advantage and a control game when the combo doesn’t come together. Decks like Abzan Company have a fair Plan A, in this case creature beatdown, but have an incidental combo Plan B, infinite life and damage, that they can assemble in the right circumstances. These decks possess flexibility that few can match, which makes them far more dangerous than they look. Over-prepare for one part of the deck and you will die to the other. Opponents are forced to split their focus between the two different victory paths which allows clever players the chance to out-strategize and out-play their opponents. Trying to directly attack these decks is dicey. The two halves may have many elements in common but you’re not likely to be able to effectively disrupt both. Sweepers are very effective against Company, but only when they preempt the combo and are committing cards to their board at sorcery speed instead of trying to assemble their combo on your end step. You might be able to out attrition Scapeshift but you’ll still be at risk of losing to Valakut, the Molten Pinnacle. It is far more effective to leverage your specialty against them. These decks are jacks of many trades but masters of none. Company’s Gavony Township beatdown plan is worse than a more dedicated deck like GW Hatebears’ and its combo is harder to assemble than Storm’s. Scapeshift has a worse control game than Grixis or Jeskai and cannot hope to combo faster than Ad Nauseam or Eggs. I recommend that you try to keep your superior specialization intact, leverage it against their corresponding plan and invalidate it, then protect yourself from other part of the deck. If you’re an aggro deck then try to win as fast as possible and pack graveyard hate to not lose to Company’s infinite life combo. 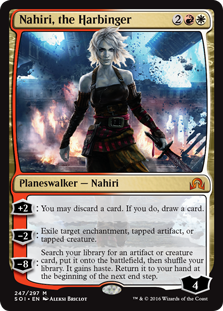 Control should maximize its counters and card advantage while keeping its life up against Scapeshift. These decks are powerful thanks to their flexibility, but weak from compromises from deck space. Exploit this weakness to win. Another easily recognizable archetype is ramp. Just like in Standard, these are decks that are looking to generate a huge amount of mana from lands to start dropping bombs. The difference is that this can start happening on turn three thanks to the Urza lands. While there are decks that follow the traditional ramp methods involving playing, you know, ramp spells like Explore and Sakura-Tribe Elder to accelerate into Primeval Titan by far the most common ramp deck is GR Tron. Tron uses land search like Sylvan Scrying and artifact cantrips like Chromatic Star to assemble Urza’s Mine, Tower, and Power Plant and start dropping seven mana threats on turn three, just like Richard Garfield intended. This mana advantage and the quality of colorless bombs makes Tron a nightmare for slower decks. Ramp and especially Tron pack very little interaction, so aggro decks that can ignore a Karn Liberated or Wurmcoil Engine can easily race. While it’s not impossible to attrition Tron out of bombs, the high number of cantrips and Sanctum of Ugin make that unlikely, though it is a viable strategy against other ramp decks. The best strategy is to attack ramp decks at their lands. Put them off their mana, which is easier against Tron than Titan Shift, and the deck won’t do anything. Once again, you do need to present a clock to actually win. It’s all well and good to Crumble to Dust two Tron pieces, but if you don’t kill them eventually they will play out seven lands and begin dropping bombs until one sticks and you die. Prison is the most unusal archetype, and it’s very unlikely that most players, particularly Standard players, will not immediately recognize it. Prison decks do not like the fact that their opponent gets to play Magic. Where unfair combo decks correct this mistake by having long turns where only they get to play Magic, Prison actively prevents the opponent from making meaningful plays. Lantern Control is the most extreme example, but dedicated land destruction decks and Enduring Ideal also fall into this category. Lantern seeks to control its opponent’s draw step and hard lock them out of making a relevant play until Lantern wins the game. LD decks do as their name implies and cut their opponent off of lands to make plays. Again, they’re preventing you from playing the game through resource denial. The easiest way to counter these decks is simply to win with your opening hand. LD and Lantern struggle against aggressive decks because they cannot attack their chosen resource quickly enough to keep an aggressive deck off the board. Lantern cannot beat any aggressive start without Ensnaring Bridge, and even with it is soft to Burn. Enduring Ideal decks can get around this through redundant anti-creature lock pieces, which makes the deck far more vulnerable to counterspell decks than the other prison decks. The other way to fight against Prison is to break their lock by overwhelming their lock pieces. If you play more lands than LD can destroy and they don’t establish a clock quickly enough, which is a weakness of the deck, you will win. Living End has a very good Lantern Matchup because it has more draw steps than Lantern can control thanks to cycling. Prison decks are very dangerous to the unprepared, but can be beaten through preparation. And those are the very broad types of decks that you see in Modern. To summarize, many decks fall under a number of traditional archetype headings and can deceive newer players into misunderstanding matchups. Hopefully this guide to the types of win conditions and strategies helps clear up these misconceptions and make Modern a little more comprehensible and approachable. I feel that I need to stress once again that this is a very general guide. I’ve glossed over a lot of important details in order to deliver a more digestible introduction. It is critical that new players research these decks and get some experience against them to really understand their matchups. Or just wait for me to work my way through the more detailed discussions of each deck type. Whatever works for you. Nice summary, David. I agree with most of the things you said (Infect and Death’s Shadow Zoo are fine with me, though), and I did note that tempo decks such as Delver and Death & Taxes were missing from it. Dredge is also a notable omission. I suppose Delver and D&T could be construed as fair decks, but fair control and midrange are quite a bit different from tempo (maybe fair decks can be split into subcategories to address that). Dredge is a bit tough to categorize in that it rips out of the gate and demands specific answers (which makes it similar to the Gotcha! decks you describe), but it also employs a go-wide strategy similar to Affinity/Elves or even Merfolk/Zoo. I don’t have a definitive answer as to where it sits on your categorization, so I’d like to hear what you think. In terms of how they actually win for the purposes of this very general outline Delver and DnT are linear aggro decks. They have a lot of extra disruption and play differently than the other linear decks, but the fundamental strategy of many small creatures attacking is the same. Obviously, once you start digging into the nuances things change. Dredge is a very hard deck to classify in this system. It utilizes a very broken mechanic and plays not-Magic most of the time but wins by attacking with somewhat unimpressive creatures. This would put it somewhere between the unfair combo decks and Gotcha!, but I don’t really think it belongs in either. I skipped it for the purposes of the Beginner’s Guide, if we see Dredge gain paper metagame share I’ll do a more in depth look at the deck. This article was really good, but I do not entirely agree with your assessment of Death’s Shadow. It does have the ability to play a “Gotxha” game, but I have found it to be more reliable than infect or bogels due to it’s ability to play a game similarly to zoo. It is a more reliable deck compared to Bogles or Infect, thanks to the cantrips as I mentioned, and it can play a Zoo style game, but it really doesn’t want to. A Zoo deck that deliberately does 10+ damage to itself is not going to set the world on fire, which is why I don’t classify Death’s Shadow as a subset of Zoo. It is set up to play a very unfair game and to win because you weren’t ready for its bullet-like kill, which in my book makes it firmly a Gotcha deck under this classification method. Obviously when I get into these in future Beginner’s Guides, I will explain more of the nuance and reasoning. Also I dont like calling Infect a gotcha deck. Infect is a very skill rewarding deck. Yes its fast so you need your answers early. If your deck can’t keep up with Infect’s onslaught and doesn’t kill it faster then you just have an inferior deck. And I dont know why you consider a deck capable of turn 3 infinite life/damage fair. Seems like you invent your own meanings of words. But why call it beginner’s guide?